My husband and I just returned from an amazing honeymoon in beautiful St. Lucia. We wanted to go somewhere we could just lie on the beach and relax so we knew we wanted to go someplace tropical, but where? Everyone had a recommendation - Aruba, St. John, Fiji, etc. It was tough trying to decide! But in the back of our minds we always knew it would be St. Lucia. Several months before, I had read about a resort in St. Lucia called Ladera - it was set high up on the cliffside and had only 3 walls. The fourth wall was open to the most beautiful view. It looked amazing! That article always stuck in our minds, and we thought-what a perfect place to go on our honeymoon! I did a lot of research on tripadvisor.com before we booked our trip. I read a lot of good reviews about Ladera, but some not so good. Also, it didn't have its own beach (which was definitely a negative for my husband), so we decided to split our 9 day trip between Ladera and another resort, Ti Kaye, which had received rave reviews on Trip Advisor. I'm so glad we did, because although both ended up being excellent, they were different experiences, and nothing short of incredible! We started at Ladera. A private car picked us up from the airport and took us on a very windy 45 minute drive through the rainforest to the resort. When we arrived, we were greeted by the staff and brought to a lovely little reception area and given a cool mint scented towel and a delicious ginger punch, which helped my husband's car sickness after that drive! 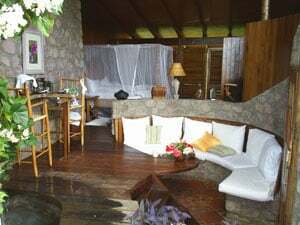 Ladera is a small resort with 18 rooms that are each different but all with the 4th wall open and a plunge pool at the edge overlooking the famous Pitons and the Caribbean Sea. Our room was incredible. The view is unlike anything I've experienced! They also have an excellent restaurant and bar area, all with the same open views that are perfect for watching the sunset. 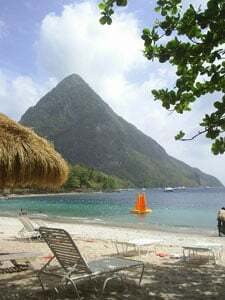 Although they don't have their own beach, they offer a shuttle to nearby Jalousie Plantation which has a very nice white sand beach right between the Pitons. Otherwise, you could take a water taxi to Anse Chastenet's black sand beach featuring some great snorkeling spots. We were able to go to both beaches but it was at Anse Chastenet that we had our first "adventure". My husband doesn't really know how to swim well, but we had recently gone on a cruise and I took him snorkeling for the first time, so I convinced him to try it again here since the water is pretty calm and easy to float in. He was just starting to feel comfortable in the water when I heard him pop up from under the surface. I was just starting to think the worst, when I hear him say "My ring fell off!". We were in 20 feet of water so how in the world would we find a ring? And then I heard him say "I see it!" My husband dove down almost 20 feet and recovered the ring! After that scare, we enjoyed the rest of the day relaxing on the beach! The rest of our stay at Ladera included a trip to the Sulpher Springs and botanical gardens just down the road, enjoying the spa and mineral baths, and sipping champagne in our plunge pool taking in the beautiful view. Overall, we found the service, scenery, and the resort to be above and beyond our expectations! We were disappointed we had to leave, but not for long because things got even better when we arrived at Ti Kaye! From the time we arrived at Ti Kaye the service was excellent. Everyone knew you and called you by name from the first day! We had our own oceanfront cottage with a plunge pool on the cliffside with another amazing view but this time of the ocean and beach below. The beach is public, but rarely was anyone else there, and only resort guests get the privilege of having a "beach dude". Ours was Terry and he was great! He set up chairs, a table, and an umbrella for us everyday and brought us whatever we needed. Ahh...just what we needed after all that wedding planning, to lie on the beach and do nothing! We did manage to get up a few times to eat at the great little beach bar and do some snorkeling, which was some of the best on the island! 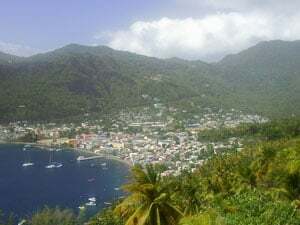 In the early afternoons we would hike back up the stairs to the resort for happy hour in the scenic bar area or sip on Pitons (our new favorite beer) back in our plunge pool, then nap in the double hammock on our cottage porch followed by a refreshing rinse off in the outdoor shower. We originally had planned to check out some of the restaurants in town, but it was just so nice to be able to walk to dinner, we ended up eating at Ti Kaye every night. 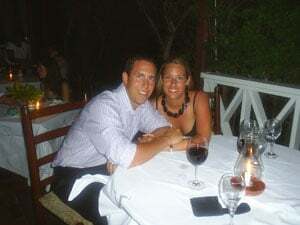 They offered a different menu each evening in their romantic, open air, candlelit restaurant overlooking the ocean. The staff at the restaurant was so friendly and they really got to know you and would help you out in any way they could. We also had a great experience during a private wine tasting with the Sommelier, Cleus. He was so knowledgeable and fun, we spent over two hours with him sharing our love of wine! Another night, we chose to have a romantic dinner on our cottage porch. The night started off with two massage therapists coming to our room and giving us both a relaxing massage with the sounds of the ocean in the background. After that, we put our robes on and went out to our porch where the staff had set up a table with candlelight, flower petals, champagne, and a delicious seafood dinner. It made for a perfect night! The resort also offers a water taxi every Friday night to Anse La Raye for their Fish Fry. Every Friday, the locals close down several blocks and set up tables and booths for the fishermen to cook up their fresh catch of the day and serve it with other traditional St. Lucian foods, all for a bargain! The streets are filled with wonderful aromas, music, and locals all mingling together to make for a fantastic night! Overall, our honeymoon was better than I could ever imagine. We're already talking about when we can go back. There are so many other activities on the island we didn't even get to! We would definitely recommend St. Lucia, and specifically Ladera and Ti Kaye, to other honeymooners. It is full of beautiful views and romance, and you can do lots of activities, or never leave the resort! The approximate cost was $6500 which included hotel, airfare, food, drink, and activities-and it was worth every penny! It helped so much that we used Traveler's Joy as our primary registry. I lived in my house for five years and did not need any of the "traditional" wedding gifts, so a honeymoon registry was the perfect registry for us. Best, all of our guests loved the idea! We never could have had this honeymoon without it and by the time our wedding came around, the honeymoon was basically paid for! It makes such a difference to go on a trip and not have to worry about what you're spending. You have one honeymoon so it was nice to be able to splurge and make the most of it. St. Lucia will always have a special place in our hearts, and we'll carry those memories with us forever.